Pleased though he was with his choices, Harry had also shouted himself hoarse at the many complainers and was now enduring a similar battle with the rejected Beaters. 'That's my final decision and if you don't get out of the way for the Keepers I'll hex you,' he bellowed. And plenty of thought is given to who's going out with who...although, naturally, everyone seems to be going out with the wrong person. 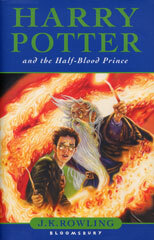 If you're keen to follow the real plot, Harry's having special lessons with Professor Dumbledore during which they trace the path taken by Voldemort from the moment when he first joined Hogwarts as Tom Riddle. I rather enjoyed this thread of the story. Suddenly, You-Know-Who becomes nearly human. 'Was this spell, by any chance, another one from that potion book of yours?' she asked. 'Why does it matter if it's handwritten?' said Harry, preferring not to answer the rest of the question. She's right, of course, as usual.